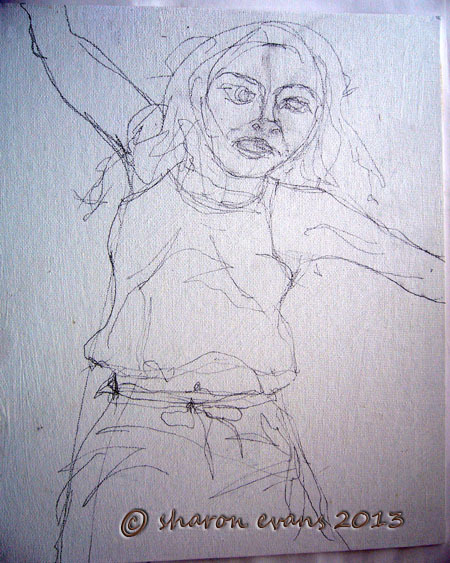 Do you ever do a sketch or draw on the canvas the layout for a painting and then are reluctant to paint over it as you know that you will not be able to get the essence of the drawing. This is what happened to me this morning. I have been doing work based on the poem I blogged about last week for ICAD and SOC. I was flipping through a magazine and saw an ad that gave me an idea for a girl dancing inside her heart. I hadn’t used the canvas I planned for SOC (a 10in x 12in) My immediate thought was …yes! So while I was having my coffee I drew this lovely. I was so pleased with her, I didn’t want to paint over as I knew I would not be able to capture that movement. Der… that’s what you have cameras for! So this afternoon I got brave and put brush to canvas. I was right I have lost that look. But I think she is not too shabby. Got more work to do, but she is getting there. I will post my ICAD cards tomorrow, and if you are interested in my SOC 2013 she is here. For the moment, I am linking to Paint Party Friday, I hope to get around as many of you as possible tonight and tomorrow. Thanks for that Tracey, You have given me an idea.... must hunt out my pens. Another direction to take. You could always print of your sketch on to tissue paper and glue it to another canvas? Dear Sharon, she is beautiful and expressive already.Lovely colours as well. Thank you for sharing with us. Have a lovely and creative week. I think both images of her are lovely and expressive in their own ways. It's great to preserve the journeys our works take as they do inevitably change, just like we do. thanks for sharing both! Happy PPF! 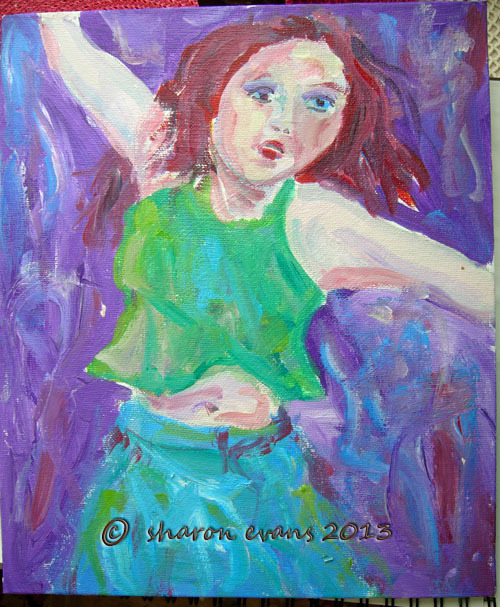 I love the feeling and movement that you captured in this piece, Sharon. Who said or wrote that beautiful quote that inspired you to create such a moving piece? Blessings! Hello Sharon, she definitely has movement, she is looking great, I can hear the music as she dances! Sharon, that happens all the time to me. However, in your case, I actually like the painting better than the drawing! It's beautiful and has so much life and action. Super energy Sharon! Well done! Love the sketch too with all the interesting lines! Fabulous! You really captured her movement and energy. HPPF! I really love the brushstrokes and spontaneity of the painting!! Wonderful! I love Tracey's comment - made me think too - I totally get what you are saying when it goes from a loose drawing to trying to capture the three dimensionality of a figure through color. Its hard and I love the idea of using pen to keep that aspect of freedom and movement under the color. Well done and can't wait to see the finished project. wow-she's wonderful and you can really see her movement too-great job! I love both the sketch and the painting, full of vibrant energy. I love her, I feel the energy of her youth! Lots of movement in this piece Sharon. They sketch and painting are both great. Ah, but to dance the night away like her. Hmmm, I haven't danced in decades. My husband doesn't like to dance. I just dance with myself, tee hee. Great work. Wow the painted one has way more movement and energy than the drawing...she is simply fabulous...love the tummy showing and how her blouse swings..Excellent job...love her! Oh Sharon, both of them are just amazing, so full of life. The image fits perfectly with the poem. I think you captured the movement well. This painting seems so alive and full of energy and movement! And it goes so very well with the poem that inspired you! Wonderful!